Mystic, Conn. (November 2, 2018) – Mystic Seaport Museum will host a major exhibition opening December 1, 2018, that explores the fate of the Franklin Expedition, a tragic story of Arctic exploration and death and one of the most enduring mysteries of maritime history – a mystery that remains unsolved to this day. Death in the Ice: The Mystery of the Franklin Expedition will display more than 200 objects from the collections of the National Maritime Museum in London (NMM) and the Canadian Museum of History (CMH), alongside finds recovered by Parks Canada from Franklin’s ship HMS Erebus. The artifacts from Erebus – the vessel was discovered under water in 2014 – will be on show for the first time in the United States. 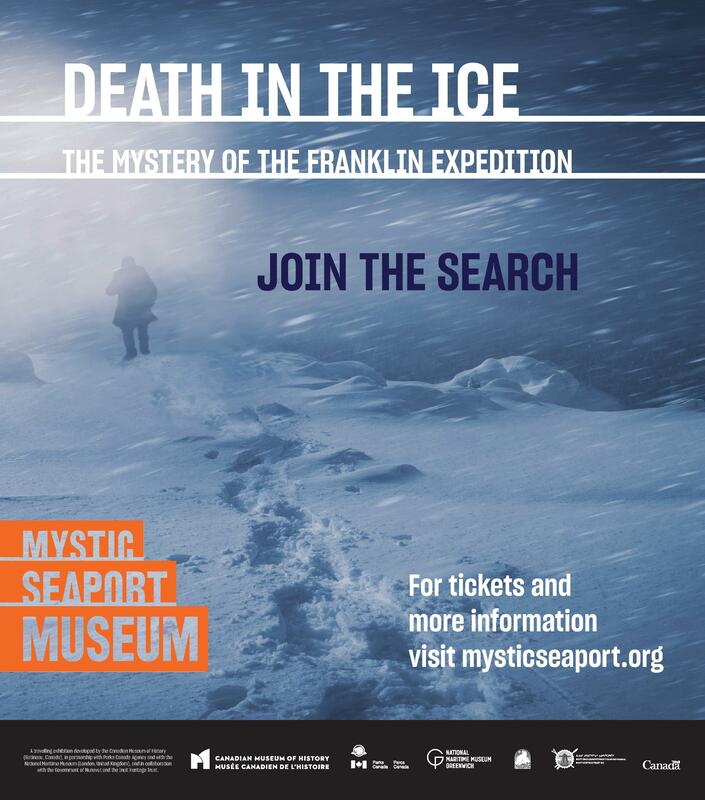 The exhibition promises to advance our understanding of the expedition and the fate of Franklin and his men. Death in the Ice will also explore both the Eu­ropean and Inuit perspectives including the importance of the Inuit to those out looking for the remains of the expedition. Setting sail from London on May 19, 1845, Sir John Franklin and his 128-man crew, aboard Erebus and Terror, were the British nation’s biggest hope of finally traversing the Northwest Passage – the much desired, possibly faster, trade route from Europe to Asia. Franklin and his men were last seen by Europeans in Baffin Bay in July 1845. Two years would pass with nothing heard from the men, prompting the first of a series of expeditions to be sent into the Arctic in an attempt to find them and the reasons why they had not been in touch with the Admiralty or loved ones at home. Over the course of the next 30 years, news and relics, such as snow goggles, cutlery, and a portable stove – examples of which can be seen in Death in the Ice – filtered back out of the Arctic and spoke to what had happened: the deaths of the entire crew through a combination of factors including scurvy and starvation, and speculation of cannibalism and potential madness brought on by lead poisoning. It was not until 1859 that a sole piece of paper, often known as the Victory Point Note (and on display as part of the exhibition), was found and revealed anything about what happened, including the date of Sir John Franklin’s death – June 11, 1847. High-resolution images are available for download from the Mystic Seaport Museum website. The Inuit Heritage Trust is dedicated to the preservation, enrichment and protection of the Inuit cultural heritage and identity embodied in Nunavut’s archaeological sites, ethnographic resources, and traditional place names. Its activities are based on the principle of respect for the traditional knowledge and wisdom of Inuit Elders. The Trust receives its mandate directly from the Nunavut Land Claims Agreement. Posted in Press Releases on November 2, 2018.